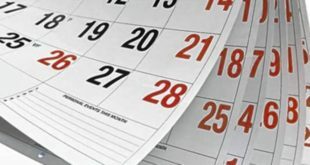 There were more than 128 deaths and over 50 injuries in the month of May. This month has also witnessed the first incident of direct violence against Shia in the nation of Madagascar. 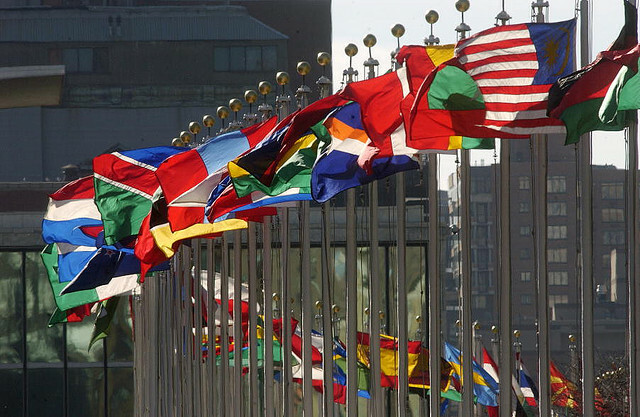 Anti-Shiism remains an urgent issue that needs to be addressed by the international community. This report will analyze a data of Shia deaths, injuries, and arrests in the month of May. Data was gathered via international news sources as well as on the ground Shia Rights Watch advocates. Authenticity and relevance of news were evaluated via corroborations from Shia Rights Watch advocates on the ground. 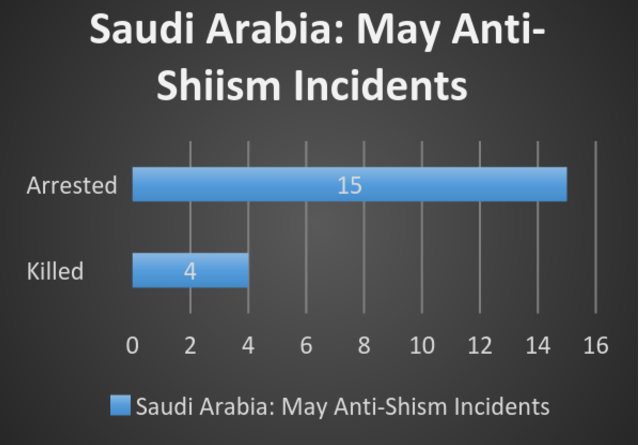 In the month of May, Shia rights have been violated in seven nations: Saudi Arabia, Iraq, Bahrain, and Madagascar. Incidents of vandalism and targeting of Shia have additionally occurred in Sweden, Philippines, and Syria. Violations include arrests, vandalism, deaths by unnatural means, and injuries. It is important to note that Shia rights violations listed in this report are a summary of incidents that have reached SRW. Violations are not limited to those in this report. More information can be found on ShiaRightsWatch.org. Following the detainment of Shaikh Isa Qasim, sit-ins and protest continue in Diraz, Bahrain. Fear of social unrest has government forces limiting town members in resources as well as clashing with peaceful protesters. The ongoing struggle for recognition makes Bahrain a location of concern for Shia Rights Watch. The Saudi siege on the town of Awamiya remains ongoing, making it a highlighted incident, as well. As Saudi forces maintain their siege on the Eastern province, resources such that of water, food and medical resources deplete, leaving the town in desperate need of international support. Early May, Saudi forces invaded the town of Awamiya beginning at 3 am. All entrances to the city were closed as forces began shooting at infrastructure. Sources report 400 houses and buildings have been demolished. With claims of renovation, the Saudi forces entered the Mosawara neighborhood with bulldozers, helicopters, and armored tanks. The Eastern province is historically home to Shia Saudi population. The area is rich in heritage centers and cultural landmarks. Despite the UN’s warning against the demolition of historical sites in Awamiya, the Saudi government has made a point to remove the culture of “resistance,” a memory of Shaikh Nimr al- Nimr, a leader in peaceful protest who was executed last year. The death toll in Awamiya has risen to five. Over 14 people have been arrested. Those targeted and killed by forces are mainly youth within the community. Among those killed are Javad al- Dagher, a two-year-old along with his father. On the 25th of May, 14 activists were sentenced to the death penalty due to their participation in the protests. Arrests were followed by psychological and physiological torture. Those prosecuted were denied access to lawyers. Names of defendants can be accessed on the Shia Rights website. The siege has left the town without water and electricity. Restrictions on travel in to and out of town further limitations. One resident reports, “No one has been able to leave their houses to go to work, school or even get food as people are afraid to move” as a result of the numerous armored tanks and forces that roam the town. The death toll in Iraq rose with yet another attack in Karrada Iraq. On Memorial Day, the explosion of two bombs in busy areas of Karrada led to the death of 80. Over 50 were wounded in the incidents. The first of two bombs was detonated in an ice cream parlor in the commercial district. The second explosion was in the form of a car bomb on the al-Shahada Bridge, near the public pension’s office during rush hour. Karrada is not a new target for terrorist organizations. In July of 2016, a car bomb in Karrada left 324 dead and was considered the largest single incident in Iraq in the past decade. The reoccurrence of attacks points to a lack of security by officials. Despite initial promises, officials have not increased security measures in Karrada. The fact that the second explosion was near a government building, one may claim, is a sign of escalation and perhaps taunting of government by ISIS. In total, 115 people were targeted for their Shia identity. The death toll consists mainly of women and children as attacks were centered in public areas such that of markets, neighborhoods and, in the case of Karrada, ice cream parlors. The setting of these attacks points to a targeting of Shia civilians by extremist groups. Despite increased international attention on the case of unrest in Syria, targeting of Shia Muslims continue in this nation. The extent of anti-Shia sentiment within the Islamic state is publicized in an incident of anti-Shiism in Hama, Syria. Fifty members of the Shia village were found dismembered in Hama- 24 of those killed were women and children. Coroner reports death by blunt force trauma to the head and dismemberment by blunt objects. Only a small number of bodies were retrieved as the state of the bodies left no room for recognition or recovery. The aggression behind the deaths point to deliberate targeting and hate towards the group. Shia Rights Watch emphasizes the need for recognition in the state of the Shia minority in Syria. Imam Ali Mosque, the largest Shia mosque in Sweden was left in ruins after an arson attack. The exterior of the mosque was charred, sources report. This incident of vandalism is not the first anti-Shia targeting in Sweden or Europe. In 2016, a mosque in Malmo, Sweden was vandalized and set on fire. 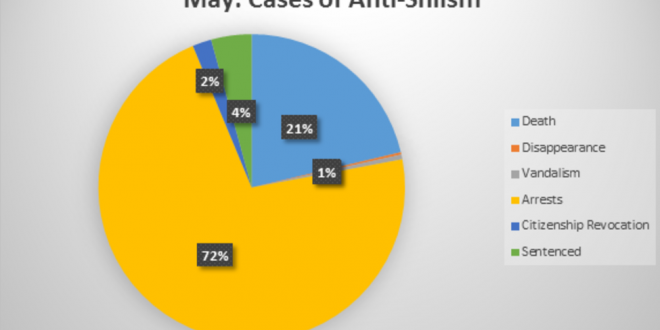 While arrests were made, occurrence of hate-crime points to an increase in anti-shia sentiment in the nation. The month of May witnessed an increase in incidents of Shia targeting in the nations of Pakistan and the Philipines. Sarfaraz Hussain along with his guard were killed as they patrolled their post in Kurram Pakistan by Lashkar-e-Jhangvi militants, mid-May. Hussain’s death is yet another targeting of Shia officials in the nation of Pakistan, where a surge in the targeting of Shia members in high tiers of society has been seen in the past few years. Philipines alone has had four deaths as a result of explosions. In the case of Nasser Abinal, a bomb was delivered to his office by a delivery man, killing his aid and injuring six others. Abinal was a government tax official in the city of Manila. In a separate incident, five Shia were killed and six others were wounded. While city officials reject extremist involvement, the Philippines have seen an increase in militants pledging alliance with the Islamic State. Incidents of anti-Shiism in this nation point to a spread of anti-Shia sentiment in the region. Anger at the sentencing of Shaikh Isa Qasim stirs unrest in the town of Diraz. Clashes between Bahraini forces and protestors has led to the death and arrest of tens of civilians. After Sheikh Qasim’s arrest, demonstrators assembled in sit-ins around the Sheikhs house. Protestors claim allegations against Sheikh Qasim are false and just another way to target and limit the Shia of Bahrain. Since the uprising in 2011, many have been stripped of their citizenship- Sheikh Qasim was revoked of his citizenship in 2016. In addition to direct violence, Bahrain’s government pressures dissent in many ways. Sources report that internet and phone lines were cut by government force, limiting those services to a few hours in the day. Further, pro-democracy activists living outside Bahrain report their family membered being harassed by officials. In a number of cases, family members were arrested with our due cause and forces to call activists and ask that they refrain from supporting democracy in or out of Bahrain. Fears of escalation exist within the region after increased arms availability to Saudi Arabia and its Gulf associates. The Bahraini First High Administrative court has ordered the liquidation of assets pertaining to the National Democratic Action Society and the dissolution of the party. Actions against political parties in Bahrain are a sign of political and economic regression. Armed assailants kidnap Yanish Ismail, a prominent member of the Shia community in Madagascar. The incident took place as Yanish was making his way home from a funeral when he was attacked by masked assailants. His whereabouts remain unknown. Madagascar is the site of newfound increase in the targeting of Shia Muslims. While anti-Shiism has been limited to education, Ismail’s disappearance is the reason for concern as it may be their watch list in fear of a possible escalation in trends of anti-Shiism. 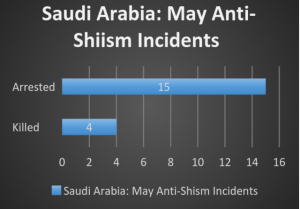 In the month of May, anti-Shiism as a direct effect of international affairs was seen. New arms deal with Saudi Arabia instills fears of an escalation of direct violence in Gulf nations such that of Bahrain. In addition to the availability of weapons, the recent arms deal with the United States has projected a message that crime against humanity by Saudi Arabia will be regarded as insignificant by western democratic nations. Incidents of anti-Shiism may be expected to rise in the month of Ramadan as ISIS leaders call for war on “unbelievers” on its supporters. A month of communal gathering, Muslims join in the month of Ramadhan, making this month a fertile time for mass targeting. 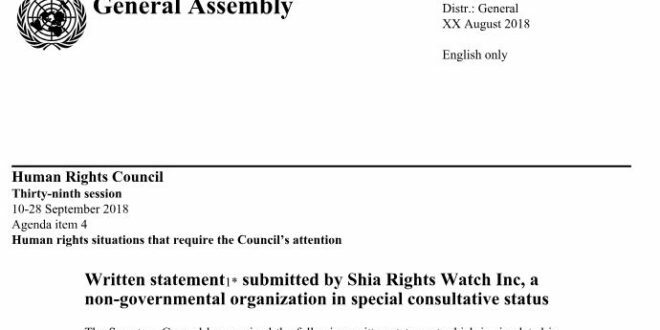 Shia Rights Watch calls for increased security in Shia-populated areas and asks governments to be aware of the dangers that target their Shia constituents.